Lord Siva and Parvathy, though ordinary people mistook it for a baby’s crying habit. parents. This outwardly appears to be a mere childish action, but the Lord knew its inner meaning. soul-stirring songs in praise of Lord Siva. The collection of these songs is called Thevaram. were very happy. They took the child on their shoulders and went round the town in a procession. The people had decorated the town nicely and received Sambandar with great devotion. to sing, with the help of the golden cymbals. Even Narada and the celestials were charmed by this. that Sambandar sang in praise of the Lord. Sambandar granted this wish. journey. They rested at Maranpadi for the night. to him. Sambandar worshipped the gifts and ascended the palanquin. that Tirunavukkarasar also met Sambandar. surprise of all. All were amazed at this miracle. that many people suffered on account of it. They entreated him to alleviate their sufferings. Sambandar sang a song, and immediately, they were relieved of their suffering. he could achieve with it, assuring him that that was a lot. regarding that as worship or adoration of a human being, but of manifest divinity. once came back to life! All of them worshipped the saint’s holy feet. to Tiru Kadavur, met Kungiliya Kalaya Nayanar and sang his glories. front of him. He sang His glories. He informed the Bhaktas of this and sent them back to Sirkali. not. He had to exchange his coins for pure gold coins, before he could obtain the provisions. described, while dealing with the life of Appar Swamigal. young Boy, pleaded that he should not go, but, realising his divine nature, let him go! king. At the same time, Mangayarkarasiar and Kulacchirai saw many good omens and were happy. got down from his palanquin and went to Kulacchirai. He lifted the minister up and embraced him. side, offered mental prostrations to Sambandar. Then, she fell at his feet. Sambandar blessed her. Divine Knowledge by Lord Siva directly and who wants to defeat us in a religious debate’. invited to argue their case and prove the superiority of their own religion. The king agreed. he could cure the disease. The queen at once went out, surrounded by her maid-servants, to invite Sambandar. Kulacchiraiar also went ahead of her. They reached the Mutt in which Sambandar was staying. establishing Saivism in the land. this. Sambandar also assured her that he was not afraid of anything. side also and the disease vanished completely. The queen and the minister fell at Sambandar’s feet. open the debate, they said that they preferred practical demonstration to theoretical discussions. considered as the real one whose inscriptions survived this test. Sambandar agreed to the condition. burnt: Sambandar’s leaf was quite safe. The Jains, ashamed to face the king, dropped their gaze. The king declared that the Jains had been defeated a second time. of the king and became Saivites. Thus was Saivism re-established in Madura. The party then reached the place called Bodhimangai. It was a Buddhist centre. Buddhanandi, the leader of the Buddhists’ group. Buddhanandi was at once destroyed by a thunder. jumped down and embraced the great saint Appar. his wife took leave of Sambandar and returned home. many palmirah trees in my garden, but all of them are male trees and they do not yield any fruits. etc. Sambandar then came to Tiru-Votriyur. worshipped Sambandar’s feet. 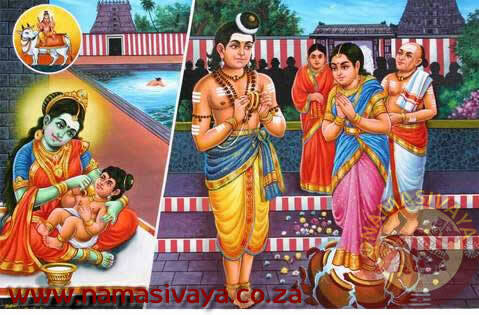 Sivanesanar entreated Sambandar to accept the girl as his wife. offered to Sambandar was dead and that the present girl had the relationship of daughter to him. spent her days in worship of the Lord and attained Him. devotees, the couple went into the temple and worshipped Him, with total self-surrender.